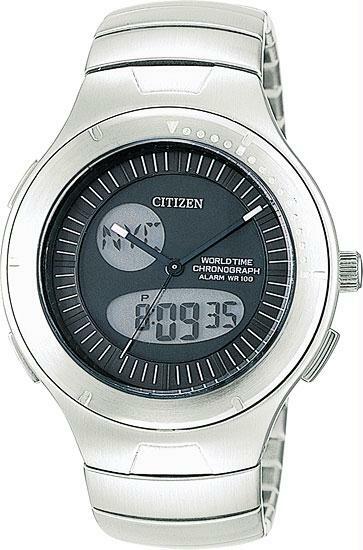 In 2003, I bought a Citizen JU0010-55E Hide-Away watch. I think it’s a pretty neat watch. I definitely need multiple time zones, because my family and the people I know are scattered all over the globe, and functions like a stopwatch, a countdown clock, alarms, and electro-luminescent back lighting are pretty nice. I don’t like digital watches, though: They always seemed cheap and for stupid people. A lot of the things mentioned above, though, are much easier and more conveniently done on a digital watch. In this watch, the digital display takes care of all of the non-essential watch functions, but it can be completely hidden away. I love it! Unfortunately, recently I must have banged the watch into something and damaged it. The most visible part was that the crown (the knob in the center right) had fallen off. I managed to recover it, but couldn’t put it back on. The watch wasn’t usable anymore. A few weeks ago, I took the watch to Box & Box Custom Jewelers in the Rice Village and asked them to repair it. I don’t know how watches work, but I was informed it needed a new stem and crown. I was promised a quote in a few days. I called several times and was told that the spare parts hadn’t arrived yet. Finally, last Friday, February 8, I was able to pick it up. I was in a hurry to get back to the office, so I paid the $92.01 (which included tax and a battery change for another watch; the repair cost for the Citizen watch was $85 before tax). I was a bit shocked at the price, but I figured my watch was repaired and the hassle over. I didn’t notice right away that the button on the lower right didn’t work. It was stuck. It didn’t move at all. I called Box & Box right away from my office, but 5:36 PM is apparently after their closing time. I left my number twice at the end, to make it easy for them to write it down, and asked for a call-back. I never got one. Today, on February 13, I took the watch back in. But before I did, I wanted to find out if the watch was still available. It is. If I ordered it today, I could have it new on Friday, with a 5-year warranty, for only $109. Considering that I paid $85 plus tax for a repair that didn’t repair the watch (only part of it), I feel robbed. I talked to the jewelers today, and they confirmed that the button wasn’t working. They even admitted that they noticed it before they let me know that my watch was ready to be picked up (they didn’t call me, I had to repeatedly call them). They also said that they were constantly in a rush while working on my watch. It didn’t strike them as odd that a button didn’t move and apparently didn’t do anything; they figured Citizen might have just put it there for looks. I feel they should have mentioned to me the fact that a button wasn’t working. They also claimed they gave me a quote, $85, and I told them to go ahead. Honestly, I don’t have any memory of that conversation ever taking place, especially since Box & Box Custom Jewelers never called me. I always called them. In the future, I will purchase CallRec for my phone to unequivocally prove what people tell or don’t tell me. Sure, I’m getting old at my 28 years, but if I had been told that the repairs would be $85, why would I have been shocked about the total of $92.01? I was never given a quote, I just can’t prove it. Had I been given the quote of $85, I would have bought a new watch for $109. I asked them what they are planning to do to resolve the situation. They said they had a local Citizen expert, and they were going to show the watch to that export. I asked them if that would be free of charge, and they confirmed it. I asked them to put that in writing, at which point the Tony Box, the jeweler, took offense and asked if it wasn’t enough that he had just told me that it would be free of charge. Sorry, pal. Not anymore. In retrospect, I should have insisted on a written quote. I’m not sure, but when he wrote “Will will will attempt to repair function button”, the triple “will” makes me suspect he was mocking me. Also, at first he didn’t write down that it would be free of charge. If the local Citizen expert cannot do anything, then they are going to come up with a “plan B”, which they couldn’t reveal yet, but which might involve helping me get a new watch at a lower price. The way that sounds to me is that they will try to sell me one of their watches for less than the regular price. I don’t think I have any interest in forking over even more money to this outfit. In fact, I am considering a charge-back on my Visa card: I consider their behavior breach of contract. I wanted the watch repaired; their expert opinion was that the stem and crown had to be replaced. Did I know that? No, I’m not an expert watch repairman. I just told them I wanted it fixed. Finally, they told me that if the local Citizen contact cannot help, my watch cannot be fixed, because Citizen does not have the spare parts. After only a few years, they consider watches obsolete. I took the liberty of calling the headquarter of Citizen Watch Company of America in Torrance, CA, at 800-321-1023 and talked to a customer service representative named Lisa. She said that most parts for this watch were still in stock, includin the buttons. Box & Box flat out lied to me! It feels good to at least have definitely caught them in one lie. I really wish I had sent my watch directly to Citizen. There would have been a $15 shipping and handling charge, and at that time, Citizen would have determined if the watch can be repaired and what the repairs would cost. Had I decided not to have the repairs done (for example because of an outrageous $85 claim), Citizen would have shipped the watch back to me free of charge. Lessen of the day: Don’t trust jewelers. At least not these guys. Stay far away from Box & Box Custom Jewelers in the village. They seem like nice guys, but their professional behavior is severely lacking. This entry was posted in Ramblings, Uncategorized. Bookmark the permalink.